Extreme heatwave, west for the rescue! Rain in the North after long time! On May 8, PWP predicted that a strong heatwave would affect Sindh from the coming week of May. On May 15, it gripped the entire country and gradually intensified on May 16/May 17. This heatwave will continue till the end of May as written in Monsoon III. Though some decrease of 2°C to 5°C from current situation could occur in the northern areas while slight decrease would occur in the central and southern parts. Around 50°C was recorded in some parts of Sindh and adjoining Punjab while above 45°C was recorded in some areas of Punjab including Lahore. The heatwave would weaken by the first week of June but will remain till pre-monsoon starts in the country. *A Western trough ’08′ would pass through the northern areas of the country on May 24 night. Western trough ’08’ could affect the northern areas including Peshawar, Islamabad and Lahore, WD’s main focus would be Gilgit-Balistan and adjoining Khyber Pakhtunkhwa. From May 24 night till May 27 morning there are chances of drizzle/showers with dust storms and thunder/lightening in the mentioned areas including North-eastern Punjab (Gujranwala, Sialkot, Lahore, Jhelum and adjoining cities). Temperatures can drop by 2°C to 5°C especially from Sunday in Islamabad, Lahore, Peshawar, Gujranwala and adjoining cities. During this period rain with moderate falls along with strong dust storm and thunderstorm can occur in Azad Kashmir and adjoining Gilgit-Balistan. However the current extreme heatwave though would be weakened after WD ’08’ passes by, will remain till the end of May as a weak to moderate heatwave till pre-monsoon precipitation. Temperatures can drop by 2°C to 4°C in Multan, Bahawalpur, Faisalabad and adjoining cities due to the presence of western winds from May 25 till May 27. During this period, sudden dusty winds can occur with cloudy intervals. The Sindh province’s upper cities like Sukkur, Nawabshah, Larakana and other adjoining cities can experience a drop of temperature from the coming week. Temperatures can drop by 2°C to 3°C in this part though heatwave would remain around 44°C till 46°C till pre-monsoon activity. Karachi’s temperature could remain 33°C/36°C during the next coming days with fast winds, partly cloudy weather can also occur. *A upper air cyclonic circulation has formed in the southern central Arabian sea and it would move towards the Arabian Peninsula with slight intensification. India getting ready for early rains! There is a good possibility that monsoon could cover Kerala, Karnataka, Tamil Nadu, Andhra Pradesh, Maharashtra including Mumbai, Goa, West Bengal and Sikkim and eastern parts of Bihar before June 10. Since the conditions are fruitful at the moment, monsoon might set over Kerala early (possibility during last days of May). Widespread heavy downpour monsoon can occur in June in these areas of India. Pakistan’s Pre-monsoon – A ray of hope? As per the latest analysis, scattered pre-monsoon showers can occur in Sindh and North-eastern Punjab from middle June, another tropical activity is also expected in the Arabian sea in the month of June. Why rains in in Sindh and North-eastern Punjab in June (as declared in forecasst of portal) are called Pre-Monsoon rains? I mean the start of monsoon dates are from the start of june. isnt it! Monsoon is still over some parts of Bay of Bengal as of now, Pre-monsoon rains are not frequent and are less in duration, proper onset of monsoon likely to be in July in Pakistan. overall conditionz kia hongi Islamabad ki is Monsoon me….any extreme event expected in Islamabad??? As of now extreme development is not seen. like the one in july 2001?? At what time in June do we expect to witness pre-monsoon rains in Karachi? Chances in Middle of June..
Pre-moonsoon Showers Karachi Mein 15th June Say Hongay Kya PWP ? Is there any chances of pre monsoon rain in Risalpur, KPK? No chances at the moment. Lahore me monsoon r pre-monsoon ki kesi barishen expected hain??? Extreme rainfalls ho skti hain kia Lahore me??? Babar bhai. Not extreme pre-monsoon, could be light to moderate. What’s the update on the dust cloud ? 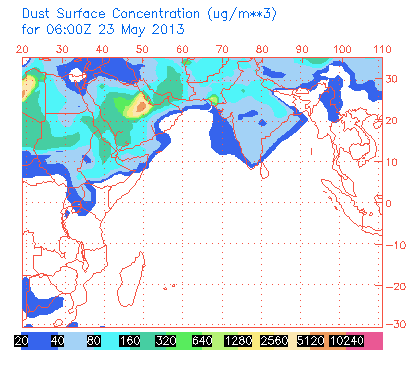 Looking at the maps, dust concentration is high over Sindh.. It usually does weaken in July however last year it stayed till early August. Is There Any Chance Of Pre Monsoon In Dera Ghazi Khan Division South Punjab? what will the condition be in isb and khaur. Chances of drizzle/showers with dust storm till Monday. @ K.M, Extreme load shedding in Karachi, very hot weather with no chance of rain in Karachi in coming many days according to forecast. Yes true, load-shedding is unbearable as humidity as increased! Models also show another system in the Arabian sea in June!! AOA.Babar Bhai Bahawalpur Me Kab Tak Rain Ke Chances Hain…. Baber Bhai when a comprehensive article (like drought,monsoon etc) on flood will be appear on weather portal? Articles on drought, floods, tornadoes, Monsoon (2011, 2012 and 2013) have been published. You must search it on the Article of the month or Archives. bhai kiya 2013 mein bhe koi bud treen flood expected hy indus rever mein?agur yes then what position in rajan pur district ? As per latest analysis, no severe development is seen over India that could affect Pakistan. pre monsoon in isb and khaur. Not much chance yet, though some clouds expected.